Our communities define us through direct participation and engagement at a local level. We work and live together to inform care priorities and guide decisions. Our community connections come alive through the many dedicated members of our community boards and foundations and the participation in our powerful volunteer force. Our community boards play an important advisory role. These community development leaders and advocates provide Covenant Health with a deeper and richer understanding of those most vulnerable in their communities across Alberta. At the same time, our community boards play a key role championing growth and development of the excellent quality care and service we provide. Want to know more about community boards at Covenant Health? Join a Covenant Health community board. Our volunteers serve shoulder to shoulder alongside our employees, bringing equal value, experience, wisdom and hope to our mission. Want to connect with a Covenant Health volunteer office in your area? Learn more about volunteering in your community. 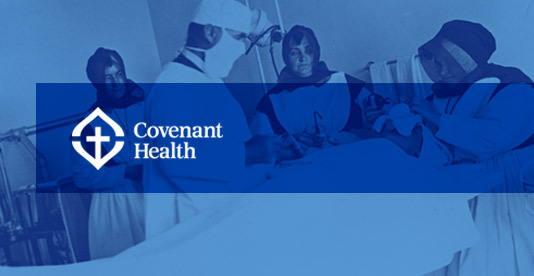 Eleven foundations are active in their communities supporting Covenant Health's work. Together, our foundations raise nearly $4 million annually in support of critical equipment and services important to Albertans. To learn more about how you can support our work, contact your local facility or consider a donation.